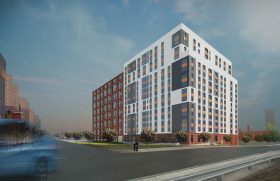 Located between East 151st and 153rd Streets, a 15-story affordable rental is now accepting applications for a whopping 107 units. Dubbed Park Avenue Green, the South Bronx building at 2980 Park Avenue is the second phase of a multi-phase housing project. Designed by Curtis + Ginsberg Architects, the building includes 154 apartments and a 4,300-square-foot community facility. Qualifying New Yorkers earning 50, 60 and 80 percent of the area median income can apply for the units ranging from a $702/month studio to a $1,823/month three-bedroom.